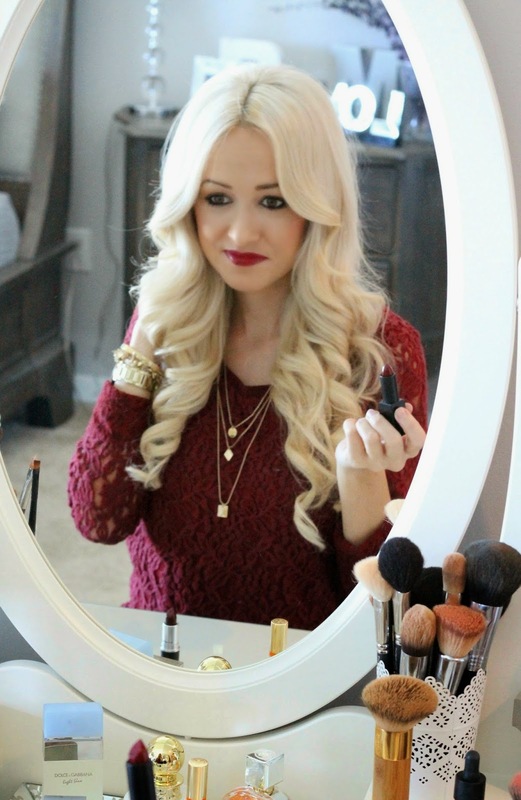 With Fall quickly approaching I thought I would do a post on two of my current Fall lipsticks. I tend to change my makeup slightly in the Fall and Winter months. 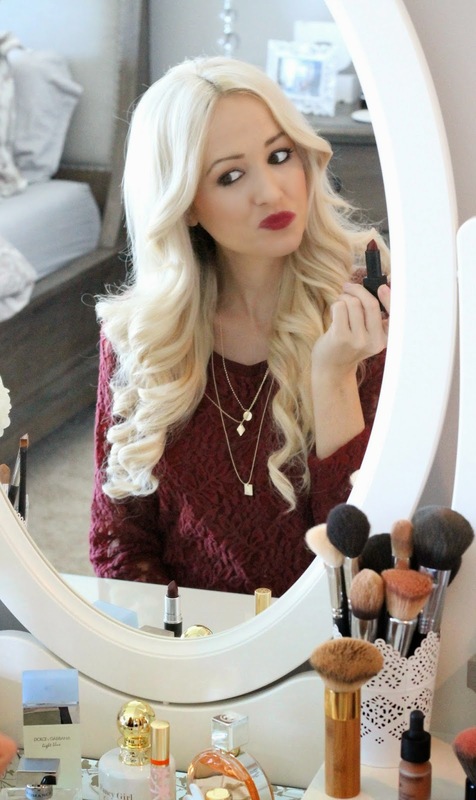 I never really wear dark lips in the Spring and Summer so it is something I look forward to about Fall. FIrst for me to wear dark lipstick I have to exfoliate and moisturize my lips. Otherwise dark lipstick looks terrible. So I do this every night after I wash my face. First I exfoliate them and then I put the moisturizer on before bed. It really makes a difference when wearing darker lip colors. MAC Sin and Nars Charlotte have been my two favorite dark colors. I love to mix them together because one is Matte and the other is glossy, so it makes a great combination. And Nordstrom in my one stop shop for all things beauty. I could wonder the makeup counters for hours. They have all of my favorite brands and products right in one spot. 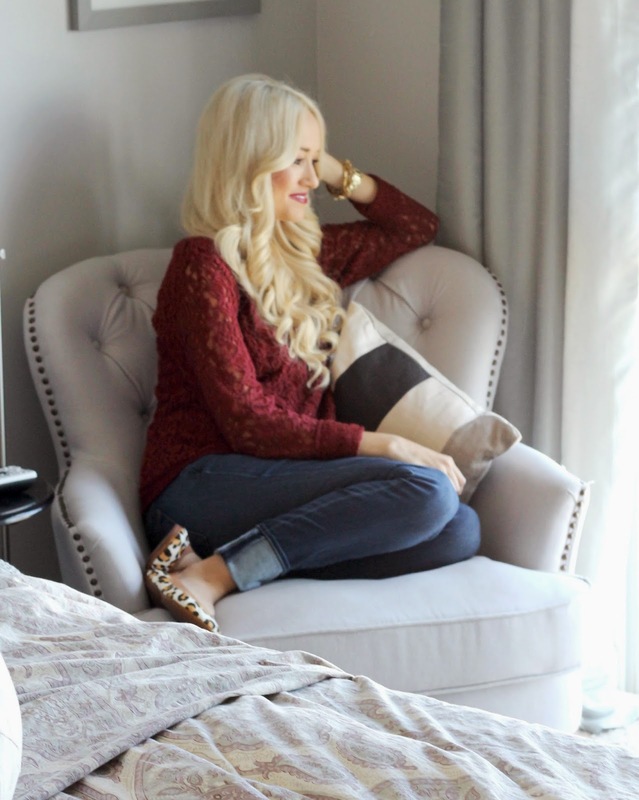 A cute sweater, skinny jeans and flats is my go to uniform for Fall. I love the color of this lace sweater. It can be paired with so many different things. And I think the lace is what really sold me on it. It is a great transitional piece. Such a cute vanity! Where's it from? Love this Jade! Your little belly is so cute. I'm ready to break out the fall colors too! Such gorgeous fall colors on you! Love this lipstick! Great color! So pretty! Love the lip color! I absolutely love Fall makeup, especially the fact that I can get away with darker lip colors. I really like trying new lip scrubs and have been using the Lush one, but I definitely have to try the Fresh one, especially since I love their lip balms. I bought a YSL berry lipstick last year and I can not wait to wear it again when the weather cools down. Beautiful!! Love the lip color!! Beautiful! So perfect for the Fall!! Qué bien te sienta el embarazo!